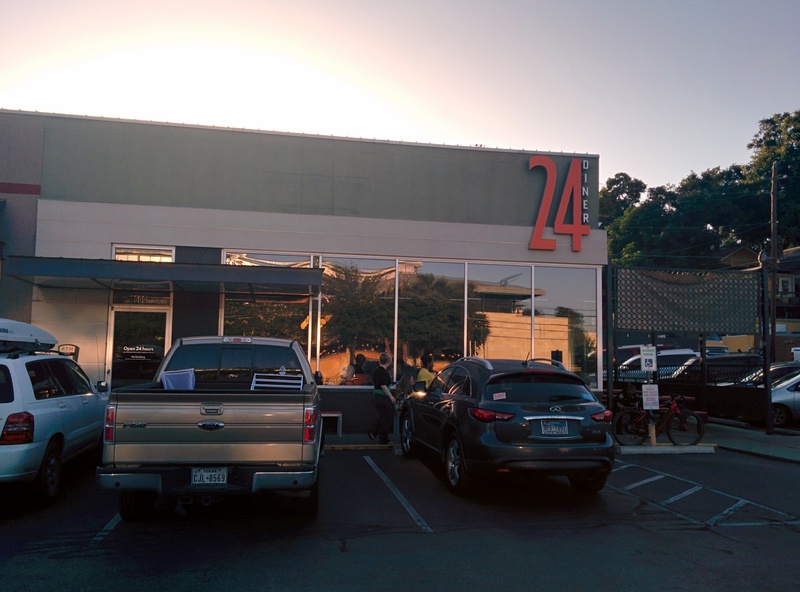 If you’re an Austin native, and you love breakfast for dinner just like me, then you probably know all about 24 Diner and have formed your own opinion of it already. So no, I’m not just going to sit here and tell you to go eat there. Instead, I’m going to sit here and tell you to go try their incredibly yummy jams. 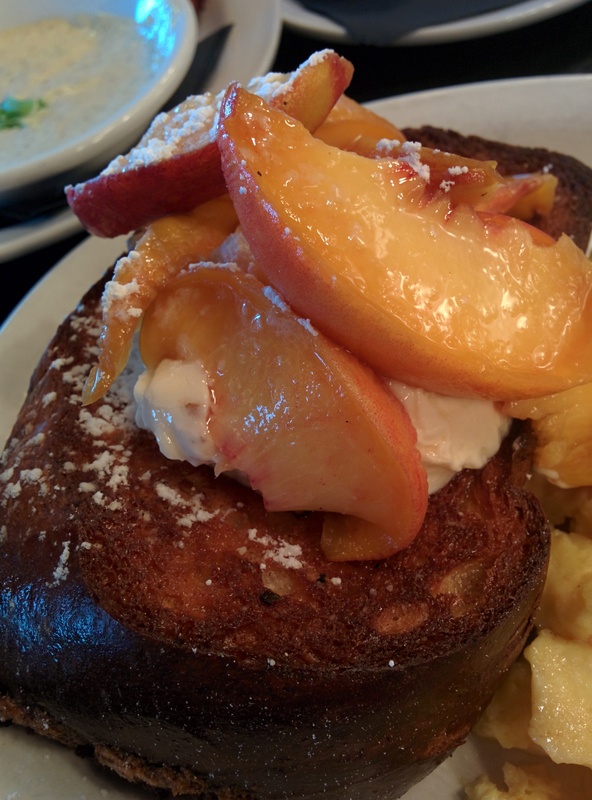 Before we dive right into the jams, let me tell you a little more about 24 Diner and why I think it deserves to be ranked higher than most breakfast places in Austin. Nothing else about a restaurant matters if the food doesn’t taste good. 24 Diner’s menu is well rounded, and although not everything is a knockout, there are a few items that definitely stand out. I. The corn fritters. I get these every time I go there. 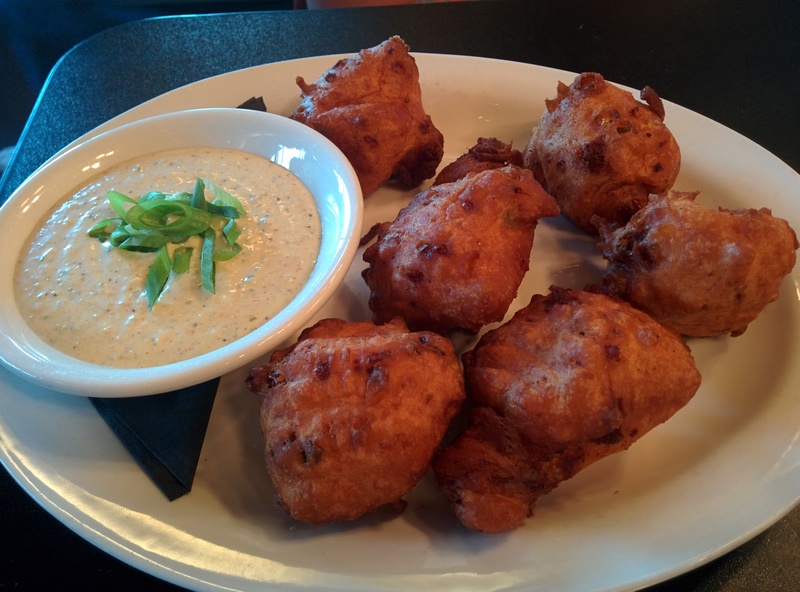 They’re fluffy and delicate on the inside, with a crispy exterior, filled with tiny bits of bacon, creamed corn, cheddar, and jalapeños, and served with a dipping sauce that tastes like a smooth tartar sauce with a kick to it. II. The chicken and waffles. Everyone and anyone who comes here for the first time needs to try the chicken and waffles at least once. The waffle is delightfully fluffy, and you can just tell from the well balanced taste and sweetness that they put quality ingredients into the batter. The chicken is fried perfectly, and you get very sizable pieces, especially if you get the full order. I finish all of the food on my plate almost 100% of the time, but the chicken and waffles has been my Mt. Everest, and I’m still trying to conquer it. To top it all off is a delicious brown sugar butter that is to die for. It adds a certain depth to the entire dish that wouldn’t exist without it. I. They text you when your table is ready. That’s right, they do not carry those annoying, buzzing devices that only work within a 10 meter radius. If you don’t want to sit outside on the benches, you and your party of six or your date can go next door to Waterloo to peruse records, or head across the street to take a peek inside the surrounding stores. Dead are the days of being crowded at the front entrance (and that’s a VERY positive thing for 24 Diner, whose front entrance area is the size of my friend’s bathroom in her studio apartment). That being said, yes, you will most likely have to encounter a wait. It’s a little quicker if you don’t mind sitting outside on the long picnic style tables, but you should definitely be prepared to wait for at least ten to twenty minutes – after all, 24 Diner has a relatively small space, and it’s a popular place to eat at. There’s even a wait past midnight on weekends due to the night life crowds (it is on 6th street after all). But not to fear! The texting concept and the staff make the wait as seamless as possible, which brings me to point number 2. Ever think “we should come back at 3 AM to avoid the weekend crowds”? II. The staff, and I mean ALL of the staff, are super friendly. Example number one: It was 3:30 in the morning, and my friends and I were getting ready to head out. I was three quarters of the way finished with my chicken and waffles, ready to box it up so I could finish the rest the next day, when I decided I needed a restroom break before the twenty minute drive home. When I came back, my food was gone, not because it had been boxed, but because the staff mistakenly threw it away thinking I was finished with it. Honestly, I blame my friends for not being more vocal and preventing my delicious food from being cast away. Regardless, our waiter felt so bad this happened that he requested a fresh half order of chicken and waffles for me. Example number two: The staff actually care about you. There’s the example that I mentioned above. Then, there’s the manager who comes by at least once at every meal to ask everyone how they’re doing. Add to it all our amazing waitress; she knew everything single thing about the menu and crushed all of the difficult questions that my family threw at her. How is it made? Where was it made? Does it come with that? What kind of cut is your oatmeal? Can I have the chicken salad without mayo? (Yes, my mom actually asked her that last question) She was also smart, personable, and funny. And as you know from my Russell’s Bistro blog post, I love it when wait staff keep their distance and only assist you at the right times. She did that and much more. It just so happens that she was also the person who introduced me to their jams. 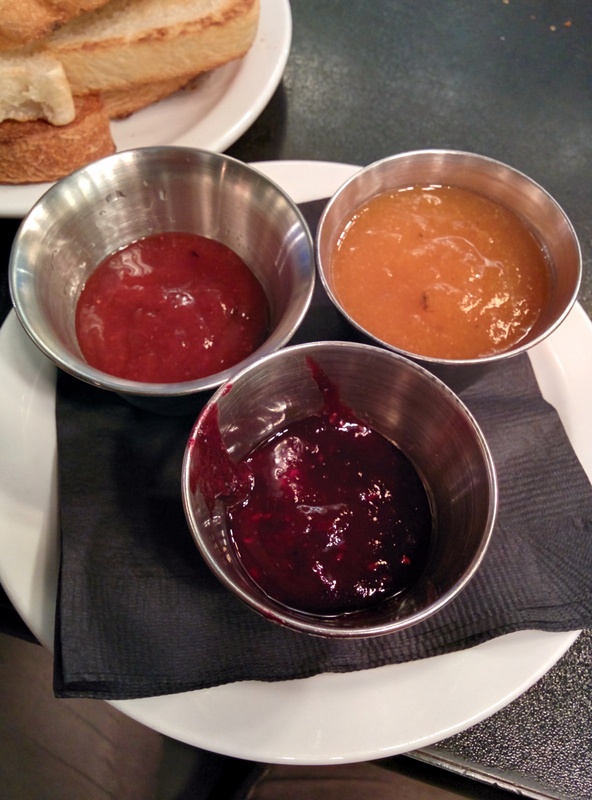 Our waitress brought out peach, mixed berry, and strawberry jams to try with our sourdough, whole grain, and rye toast. When she placed them on the table, she told us that she loved the peach jam so much that she can eat it by itself. And she was right. When we ran out of bread, I ended up slapping a lot of peach jam on my waffle, and when I ran out of that too, I ended up using a spoon. By the end of the night, all of the jam was gone, and I knew that I needed to pay a second visit to try some more. 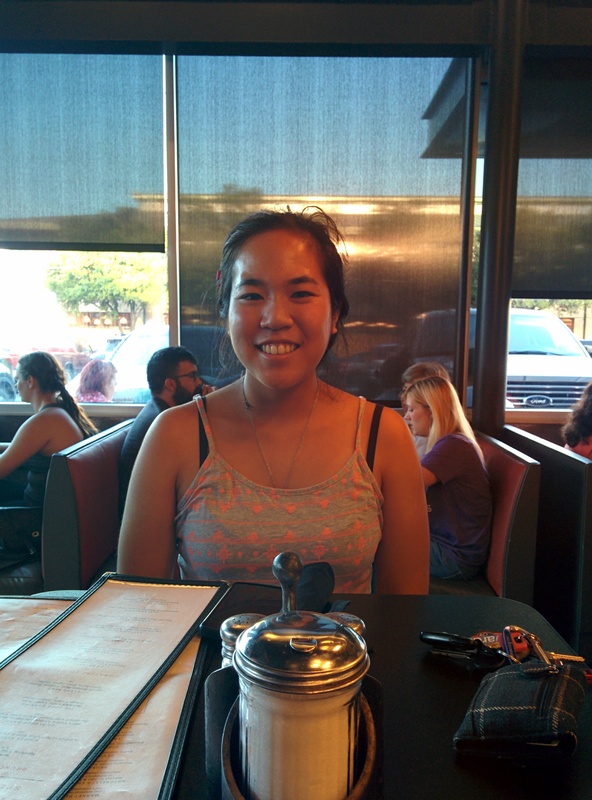 One week later, I went back with my friend Jessica. I started off by spreading the jam very delicately with a knife, and I ended the night by downright pouring the jam on top of the toast. If you’re anything like Jessica, you’ll tear the toast into smaller pieces and dip them into the jams. I highly recommend trying my pour method. I’ll let these pictures speak for our visit themselves. Yes. 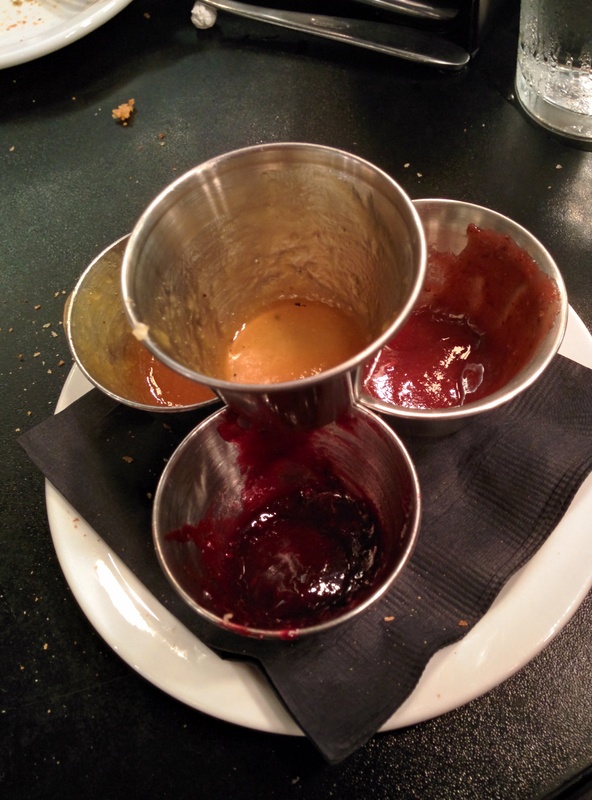 Not only did we manage to finish off the first three jam containers provided to us, but we went on to finish a fourth. All the waiter could do when we asked for a fourth container was laugh. And I don’t blame him. Strawberry jam – least sweet of the jams and has the thickest consistency. This gives it the most natural texture of all three jams. Unlike most processed jams in super markets, this tastes like they just plucked fresh strawberries, hired a professional masseuse to massage them into a thick paste for twenty straight days and nights, rendered them down in a pot, and then served it straight to us (*full disclaimer, that is not actually how jams are made). Goes best with the rye bread, and a definite must have if you love strawberries. Mixed berry jam – definitely the sweetest of the jams, and in a good way. A little tartness still comes through right when it hits your tongue, but as you let it sit for a while in your mouth, it starts tasting very berry-like. This one has the most liquid consistency of all three, and it goes best with the sourdough bread. When compared to the strawberry and peach jams, the mixed berry is my least favorite one, but that’s still saying a lot. Peach jam – the creme de la creme. The best of the best. I can put this jam on anything and it still tastes good. Toast? Good. Waffle? Good. Mix it with other jams? Questionable decision at best, but still very good nonetheless. You get a very distinct peach flavor with every bite, and the very subtle lumpiness of the jam gives it a great consistency that can’t be beat. Not too sweet, and not too thick, the peach jam is definitely the mama bear of the jams. Be adventurous. Order only toast, and demand that all three jams that they carry be carried to your table. Be bold and order more if you run out. Do not be afraid to go overboard on your jam to bread ratio, because there’s absolutely no wrong way of doing it. Oh, and last but not least, you should probably give their other menu items a shot too. That is, if you haven’t overdosed on jam and bread already. 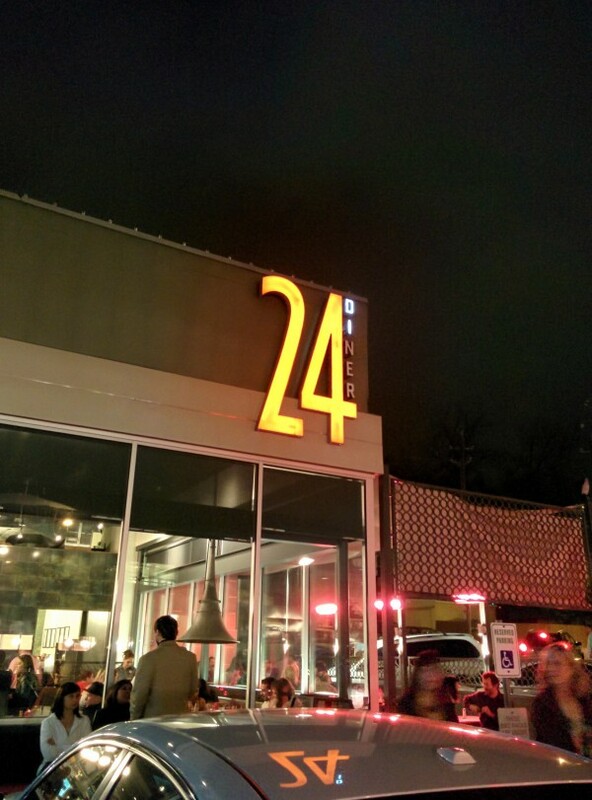 To find out more about 24 Diner, visit them here. Haha thanks! I’m glad I’ve convinced you. 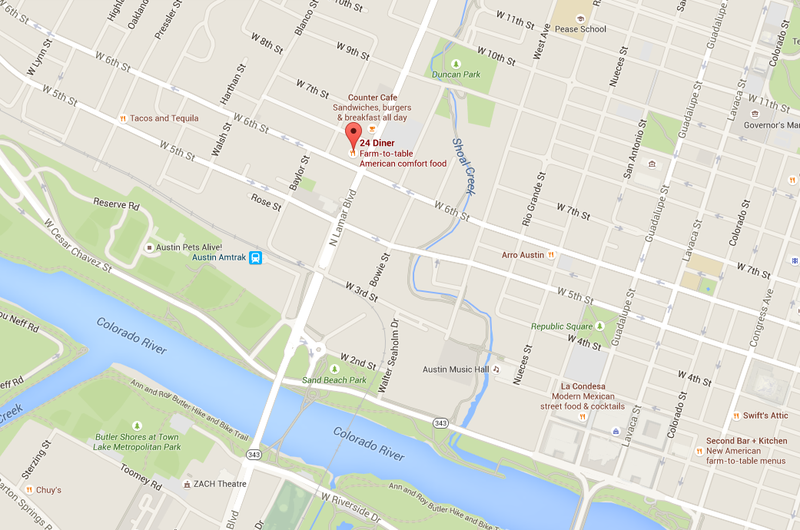 Pro tip: If there’s ever an event close by, say at Zilker, my advice is to park somewhere in the middle, head to 24 Diner for a meal, and then make your way over. It ensures a good parking spot, there’s no stress of traffic, and you get to enjoy a good meal.